For eMusic please select a quantity equal to the number of copies being made. 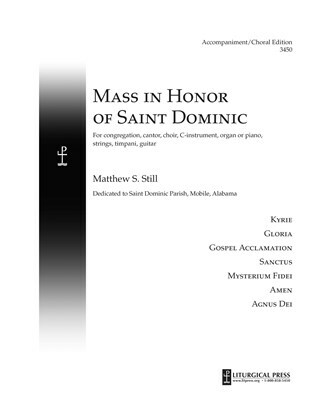 All music published and administered by Liturgical Press is covered under OneLicense.net and you can report assembly usage through their website. If you do not have OneLicense.net, a lifetime assembly reprint license for this Mass setting (melody / text only) is available by calling us at 800.858.5450. All content available from the Liturgical Press website is protected by copyright and is owned or administered by Liturgical Press. You may print or download to a local hard disk this eMusic PDF for your personal and non-commercial use only equal to the number of copies purchased. Each reproduction must include the full title and copyright notice as it appears on the page. Unauthorized copying, reproducing, republishing, uploading, downloading, distributing, forwarding, posting, transmitting or transferring this PDF to another party is a violation of copyright law.